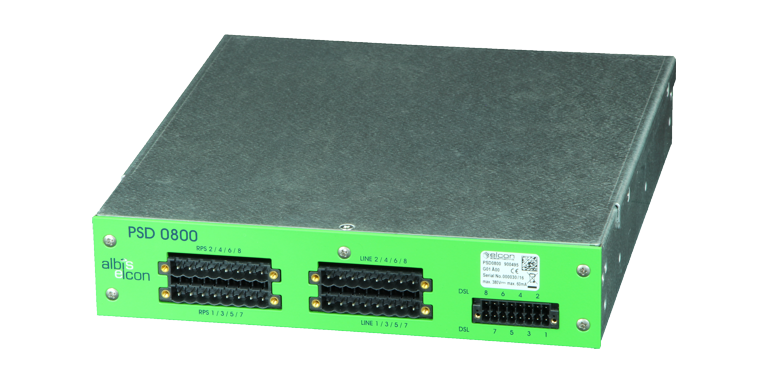 The PSD 0800 is an 8 channel (8wp) RFT-C remote power combiner and splitter (diplexer) in one unit. With the help of this device not only free copper pairs could be used for remote feeding but also such lines, where already a VDSL2 or ADSL2/2+ service is operating on it. By using this device, the CAPEX costs for FTTx or mobile site deployments could be further reduced as the fiber line for broadband access of these nodes becomes obsolete when using single or bonded VDSL2 lines (e.g. using BIG28 product) connected to a standard DSLAM. The diplexer can be co-installed with PSC1600/ PSC 08xx and PSR 083x unit and do support VDSL2 signals up to profile 30A (up to 100 Mbit/s transmission speed).